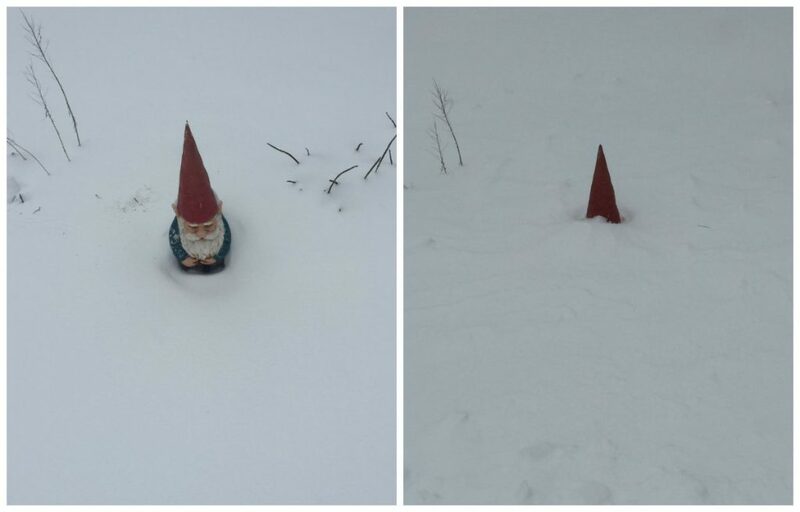 How are Mainers coping with the blizzard? The storm that began Sunday was the biggest one of the season for some communities. 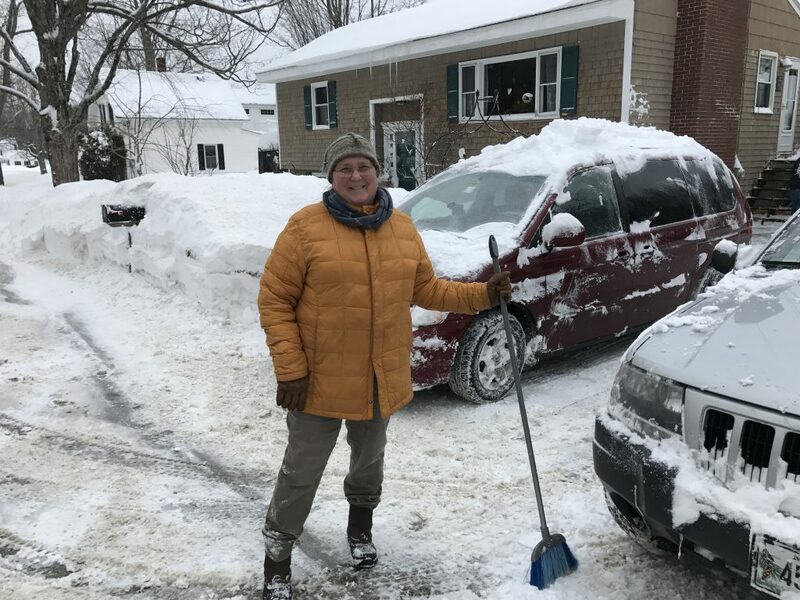 We checked in with Mainers in various towns to see how they were dealing with the storm Monday. 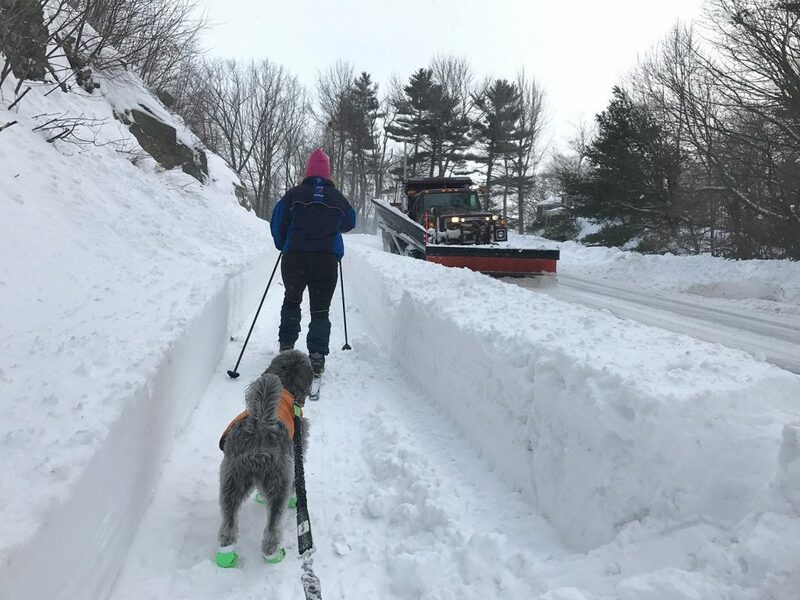 On Munjoy Hill, residents took up shovels and machines to carve paths from the drifts covering sidewalks and driveways. John Yates, 45, of North Street, said his snowblower’s starter motor blew Monday morning, so he has to wait to borrow a neighbor’s. 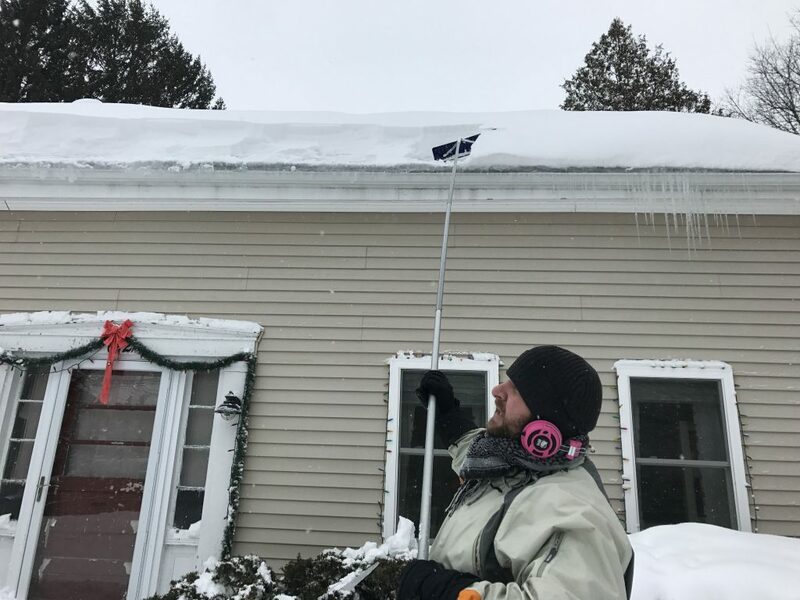 nOn Stevens Avenue, 38-year-old Victor Ross began clearing his driveway at 7 a.m. By 11:45, Ross started on his roof, manipulating a long rake handle in buffeting winds. “Usually the wind blows it off,” said Ross, who likes to keep the warm sounds of California ska music playing through his headphones to keep him going. Although technically off from work, after five hours of shoveling and snowblowing, Ross was ready for some down time. “After this I’m taking a nap,” he said. n Jon Bradley, associate director of the Preble Street Resource Center, said his staff members have coordinated with the city homeless shelter to ensure there was always a place to go during the storm’s harshest hours. Oxford Street Shelter managers kept the shelter open all day Monday, Bradley said, and would continue to do so from Monday night into Tuesday morning. At Preble Street, dozens of people milled around the center’s main room, charged electronic devices, dried their boots or nodded off quietly. The Portland Public Library and Amistad, two favorite places for the city’s homeless to find a quiet moment alone, were closed Monday. So it was all hands on deck at the resource center, Bradley said. Staff at the resource center have only an hour or two between when the main area is converted from daytime hangout to overflow night shelter, where up to 75 people will sleep on foam mats. Although the storm means more people are crammed into a confined space for longer periods during the day, there have been few incidents of bad behavior or fights, he said. The second time was the charm for Katie Damon and her three children Monday. 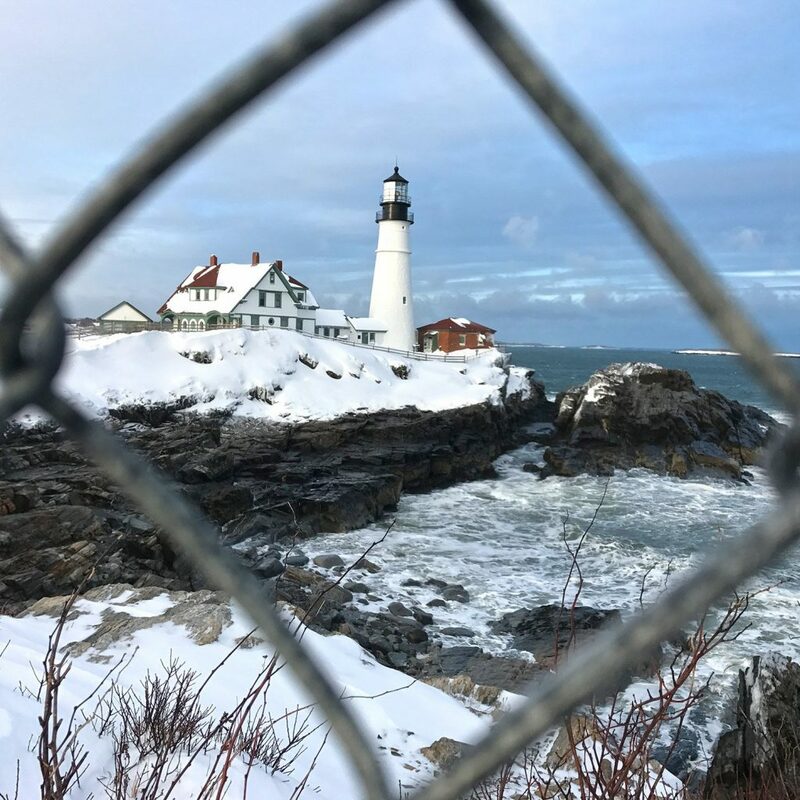 Damon said she brought her two boys and her daughter to Fort Williams Park in Cape Elizabeth for some sledding early Monday afternoon, but they turned back after seeing that no one else was out. 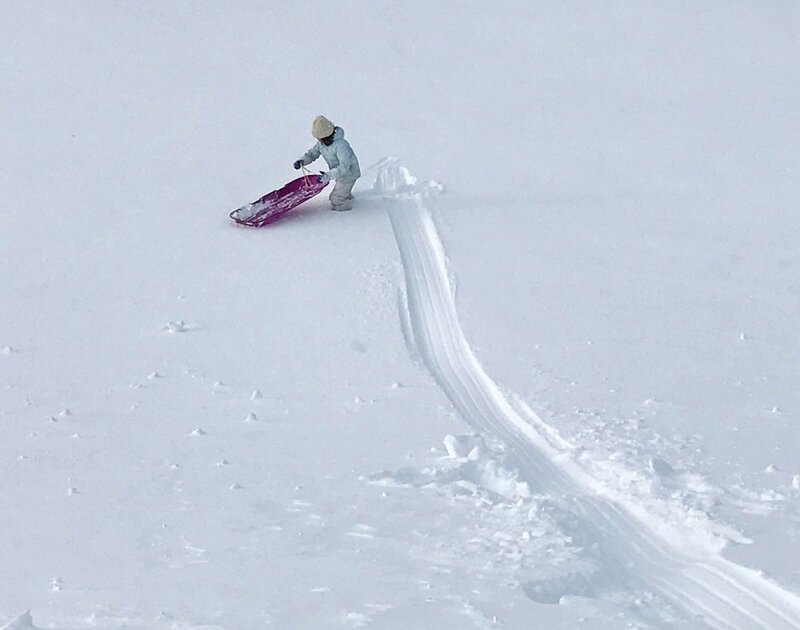 They returned around 4 p.m. to find at least a few kids taking advantage of more than a foot of fresh powder and decided to join in. 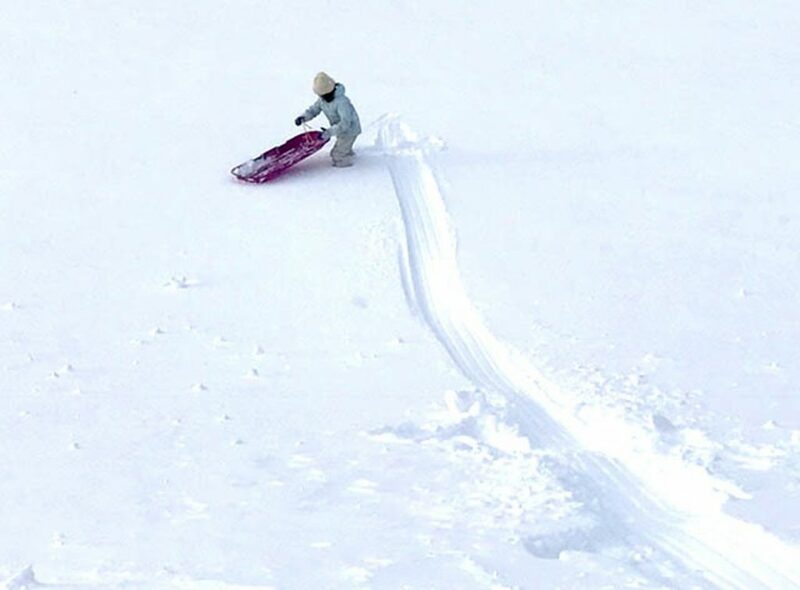 Paisley, 8, Drew, 9, and Parker, 11, were still able to cut fresh tracks through the snow on their saucers. Even though the conditions were good, the normally popular hill wasn’t crowded with kids looking to slide down the slope. Damon said the outing would give her kids a chance to burn off some energy before dinner, bed and then a likely return to school Tuesday morning. She said her children were happy with Monday’s heavy snow – and the day off from school – but were surprised to see that the snow had stopped falling by the time they woke up. Still, strong winds kept whipping the snow around Monday evening, and plow drivers were kept busy in town trying to keep roads and driveways clear all day. Lt. Mark Brooks, commander of Maine State Police Troop C Barracks in Skowhegan, said people mostly heeded warnings to stay home and off the roads Monday. “Most of the public are in their homes so that has greatly reduced normal Monday morning traffic,” Brooks said. Brooks said state police received calls for assistance for vehicles that slid off the road and for about a dozen crashes, none with any injuries. By midday, state police had asked tractor-trailer drivers to stay off the interstate because multiple crashes across the state were blocking roads and ramps. Both on- and off-ramps for exit 127 in Waterville and 133 in Fairfield were blocked much of the day by tractor-trailers that got stuck, and high snow drifts across Route 201 in Fairfield stopped traffic as well. As for criminal activity in Somerset County, potential offenders also appear to be staying close to home, Brooks said. “There are no friends on a powder day,” Emmett Peterson told his Bates College classmates as he headed for the chairlift at Lost Valley Ski Area in Auburn. “It’s awesome at Lost Valley just to rip it up,” Peterson said. While he did actually wait for his friends at the chairlift, the saying is a mantra for skiers and snowboarders who claim that first tracks on a snow day are for those who can get them. 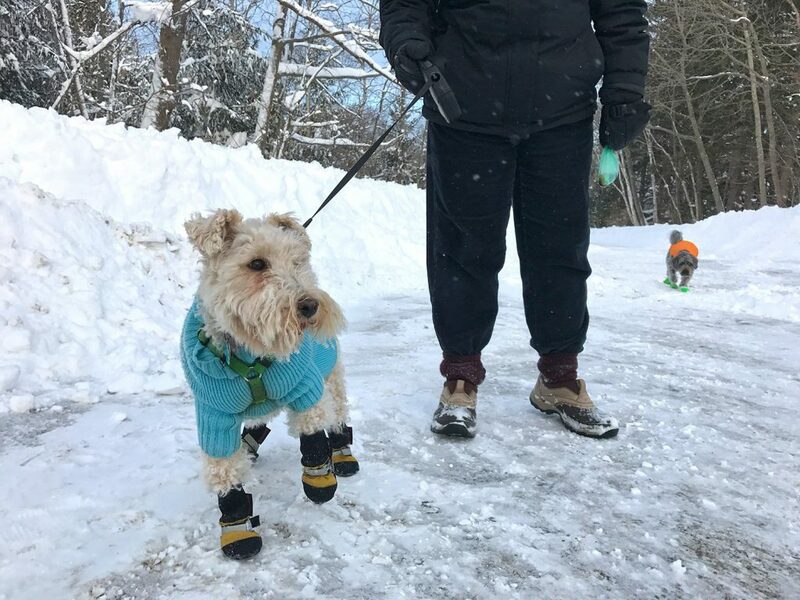 Peterson, 21 of Burlington, Vermont, said he and his friends were having fun in the new snow Monday. 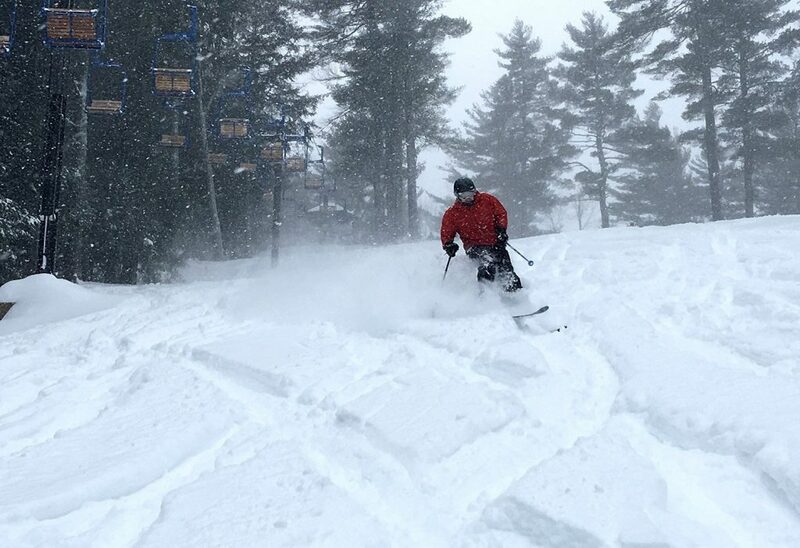 The group of four were among a few dozen skiers who turned out for the resort’s 3 p.m. opening. With Peterson was Maddy Ekey, 21, of Bozeman, Montana; Nathan Diplock, 21, of Amherst, Massachusetts; and Kathleen Smith, 18, of San Francisco. “I’m really hyped to see so much snow out here,” Smith said. 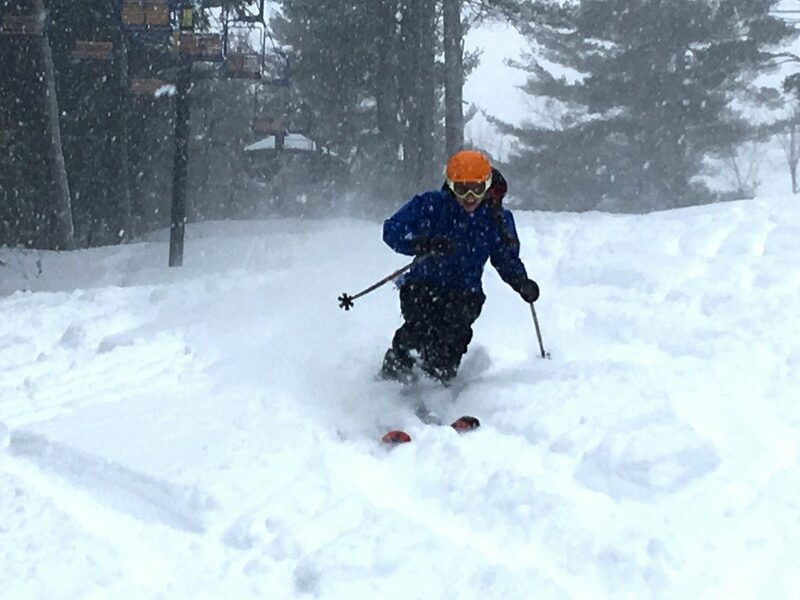 Gerry Desjardins, director of the Lost Valley Ski Patrol, said new snow – and a lot of it – helped lift spirits at the resort, especially after Maine ski areas saw a light snow season in 2016. By late afternoon, there were over 100 skiers at the resort. Blowing snow started receding in Biddeford around 4 p.m., giving people a chance to clear out from roughly 2 feet that fell Sunday and Monday. The streets were still unusually quiet for a Monday afternoon, as many people heeded warnings to stay home and indoors. 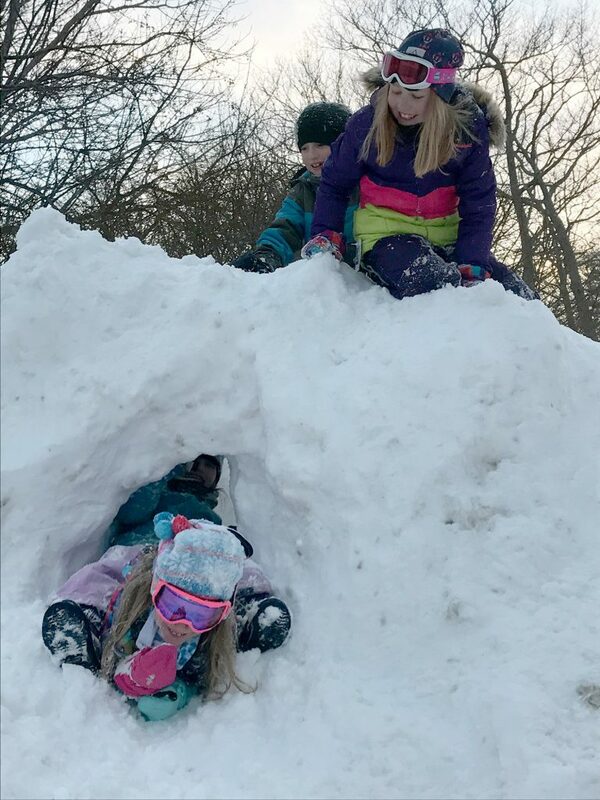 But the fresh snow gave Kayla Brown, 5, and Sophia Dolloff, 8, a chance to do some sledding while their parents cleared off cars and stairs at their apartment on Laurier Street. 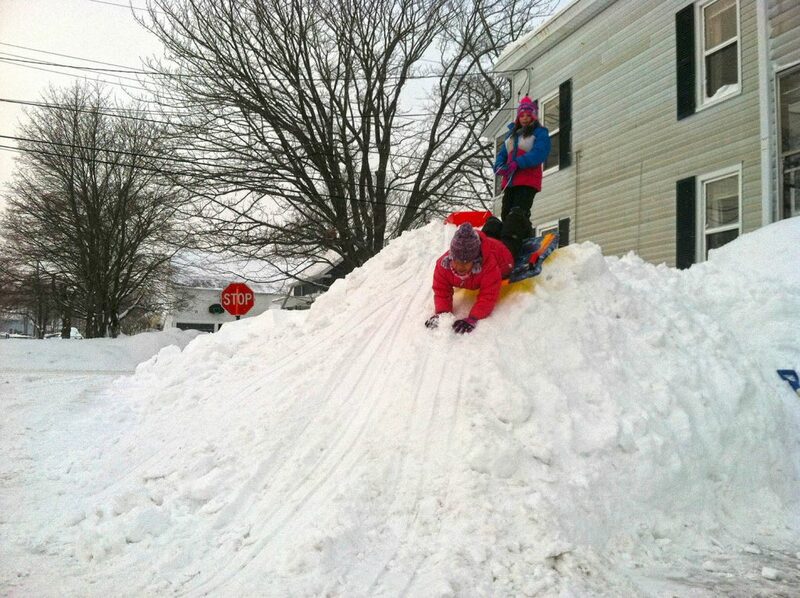 “School was canceled!” Kayla exclaimed, as she dove head-first down a towering, 8-foot snowbank. Residents in Gray were busy digging out as the snow began to wind down before 11 a.m., with snowblowers throwing large white snow puffs high into the stiff breeze. A compact layer of snow lined Route 100, which was quiet other than the occasional snowplow. Ice and snow encased the digital sign advertising summer camp jobs in front of the Henry Pennell Municipal Complex. Janet Farrington, 61, was among the residents of Colley Hill Road moving snow Monday morning. She said the storm brings out the best in her neighbors. One neighbor used his plow to move the heavy snow blocking the end of a driveway, while another neighbor used his riding snowblower to clear snow around the vehicles. That left little for Farrington and her 67-year-old husband to do with their own snowblower and shovels. The downtown Freeport shopping district, normally bustling with activity and shoppers, resembled a ghost town Monday afternoon. The sidewalks and parking lots were empty, there were no cars or pedestrians on Main Street, and some businesses remained hidden behind walls of snowbanks. Inside the retail store that never closes – L.L. Bean – a few shoppers wandered the aisles, but for the most part the store was empty. The L.L. 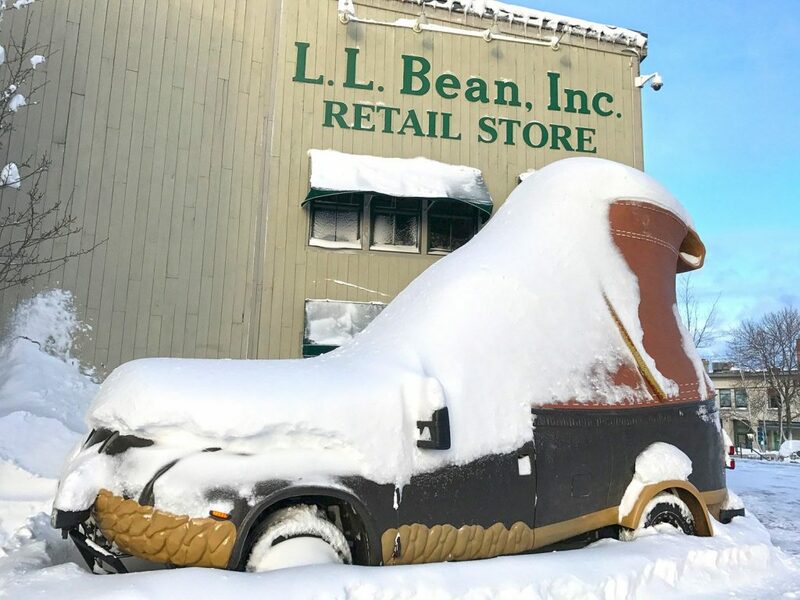 Bean Bootmobile, which was parked outside the camping department, was buried under a blanket of snow. Staff Writers Matt Byrne, Edward D. Murphy, Scott Thistle, Peter McGuire and Randy Billings contributed to this report.